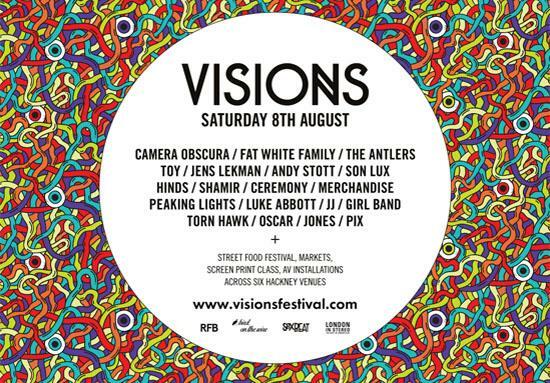 Visions have announced the next wave of artists set to join this year's line-up. The event, taking place in venues across Hackney in London, will take place on Saturday 8 August, with sets already announced from Fat White Family, Toy, The Antlers, Hinds, Son Lux, Ceremony, Andy Stott, Peaking Lights, Luke Abbott, Torn Hawk, Girl Band and Jones already announced. Added to the bill today are Camera Obscura, Shamir, Jens Lekman, possibly showcasing material from his forthcoming new album, JJ, Merchandise, PIX and Oscar, with more acts set to be announced ahead of the festival. The festival, now in its third year, is a collaboration between promoters Rockfeedback, Sexbeat and Bird On The Wire, and will also feature a host of exhibitions from local artists. Tickets are available for the event here.